After being down for the count for a week, the car hit the road again last night. I had it on the ground and running on Tuesday night, but I still had a couple tiny things to take care of, so I didn’t drive it to work yesterday. The car had been taking a few tries to start and the key had to be in the perfect position for the starter to actually fire. It has been getting worse for about a month and I was getting concerned. What it would look like if I was working on my car in '98. lol. Huge thanks to Nick, Mike, and Mark for hooking me up with a replacement transmission and lending a hand with the install. I drove the car to work today and it is crazy how much smoother the shifts are. My old trans must have been majorly messed up. It’s weird to shift into fifth without the dreaded grind or needing to double clutch, lol. In a little over 24 hours I will be heading to Chicago for WekFest! Really looking forward to the trip. I’ll try to do a couple of posts during the event a writeup afterward. Looking forward to it! 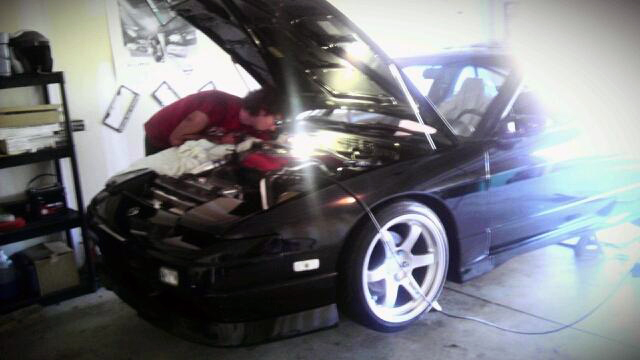 Congrats on fixing the hiccups Damon..cant wait for the WEKFEST coverage! Thanks Freddy! I’ll try to get my coverage/thoughts up tonight or tomorrow.